Thank you to all of you who played along this week. Once again, the submissions were amazing and it was so hard for our design team to choose their winners. Before we get to the HEADLINER for this week, lets check out the fabulous creations that caught the eye of our design team. 1. Sandy: Nicole's springtime scene is so precious! I love the adorable dwarf and tufts of grass. 2. Laurie: I love Heather's warm and sunny card! Congrats! 3. Joanne's Choice: Cynthia's beautiful daffodils and watercolour panel are Spring CAS perfection! 4. Annie's Choice: Jen's super cute poodle, pink polka dots, and punny sentiment won me over. Woof! 5. Jan's Choice: Laurie's bright tulips, set against a clean black and white ground, are gorgeous. 7. LeAnne's Choice: Maria's sweet floral print and wonderful tag is CAS perfection! Congrats! 8. Elizabeth's Choice: Pat, You Rock! Your faux diamond shaker is perfect! Love the glitter and stars! Now, on to our HEADLINER. I fell in love with Mugdha's beautiful bouquet of hand-cut and punched flowers. All of that wonderful white space really allows the focal images to shine. I also loved the hand-written sentiment against that wonderful green background. The little pearls in the middle of the flowers were the perfect finishing touch. Stunning card. Mughda, congratulations on being my HEADLINER this week. I hope you will join us again tomorrow Joanne's wonderful tic-tac-toe challenge. Thank you so much, Annie, and congrats to all the other winners! Congrats, Mugdha. Thanks for picking my card, Jan! Ohhhh! Thank you so much for including my dwarf into the cut aboves from this challenge! I am so happy to see him there. Your comments are all so kind. I will love to display your badge on my blog. Congratulations to all cut aboves and to the headliner. 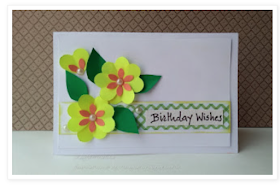 It is so nice to see all these happy springtime cards.